Hi! Following from Simply Stacie! Shoot...I can't remember if I commented or not...and since I don't see it, I'm gonna take a chance that I didn't. LOL. I'm stopping by from Simply Stacie...stumbled and following! I'm your latest follower through the blog hop. I'd love for you to follow me back at www.diybydesign.blogspot.com. Thanks. I am your newest follower from FMBT. I would love a follow back at my blog! Stopping by via the Tuesday hops to say hello and to follow. 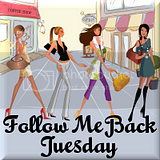 Return the follow love from over at YUMMommy. Looking forward some awesome reviews and giveaways. newest follower from tuesday blog hops. I am your newest follower from FMBT! Please follow me back at Ozark Mama Reviews!